This yogurt and cucumber dip, known as Mast-o-Khiar in Persian, is made from cucumbers, yogurt, and mint. It’s like tzatziki. Mast-o-khiar. 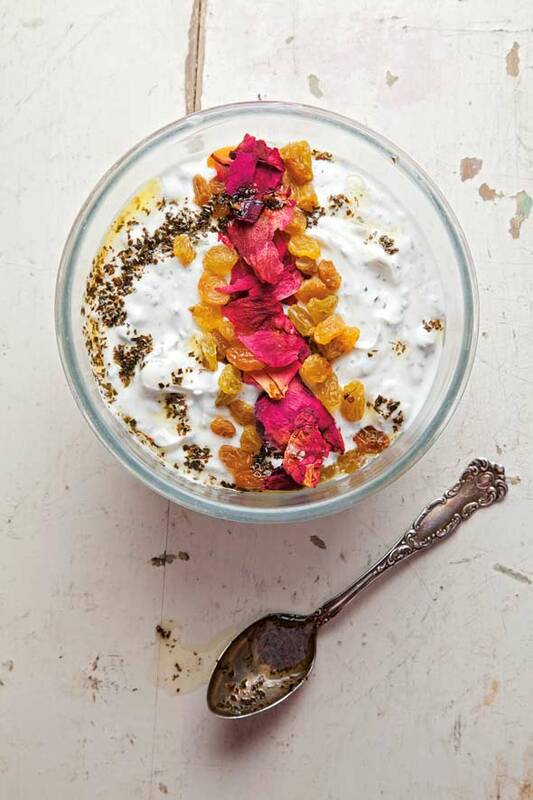 It’s Persian for cucumber and yogurt, and yes, it’s what you get here. But that’s an overly simplistic summary of this traditional Middle Eastern dip. True, mast-o-khiar is not unlike Greek tzatziki, though this traditional rendition ups the ante with rose petal leaves, if you please. And yes, Greek yogurt works well in this recipe. A smattering of chopped toasted walnuts would also do well here, should you be the type who likes to juxtapose a little crunch with velvety creaminess. We even know those who’ve forgone the sweet golden raisins for tart cranberries, though again, that’s up to you. As for how to dispatch this dip, that’s entirely at your discretion. 1. Place the raisins in a small bowl and add enough warm water to cover. Set aside until soft, 8 to 10 minutes. 2. On a cutting board, sprinkle the minced garlic with kosher salt. Using the side of a knife, mash the garlic into a paste. Transfer it to a bowl. 3. Drain the raisins and stir almost all of them into the bowl of garlic along with the yogurt, mint, and cucumber. Garnish with the remaining raisins and the rose petals, if using. This is fantastic served on grilled flatbread. The flavors blended well together. It’s creamy but has great crunch from the cucumbers and a touch of chew from the raisins. It’s cool-tasting but has a nice garlicky hint of heat. I’m not a huge fan of mint, but found the addition of a tablespoon fresh mint refreshing. It comes together very quickly and can be served immediately or a little later. This is a great sauce, dip, or sandwich condiment. It’d also be lovely on grilled chicken. It goes well on just about anything. I’ve long been a fan of cucumber raita, a wonderful Indian condiment. So when I came across this Iranian version, my interest was piqued. The most surprising quality about this dish is the golden raisins. I was initially hesitant about the addition of them, as I’m not usually fond of raisins in recipes. However, I found they added a subtle sweetness and great texture to the tangy yogurt mixture, making them pertinent to the dish. This dish would do well next to almost any meat as well as on its own with flatbread. I used fresh mint instead of dried, as I feel the flavor is far superior. All in all, this was a delicious dish that I plan to make again very soon. This is delicious all by itself, although I’m sure it’ll be a wonderful accompaniment for other dishes, lamb in particular. It’s very refreshing, with just enough sweetness from the raisins. I used nonfat Greek yogurt because I think it’s as rich as the full-fat version of other yogurts. A quibble: I tried to mash the garlic as described, but I finally gave up and used a mortar and pestle. Tasty, refreshing, and compatible with many contexts, this will be a make-often recipe for me. I used 2% yogurt, fresh mint, and small Persian cucumbers, plus the optional dried rose petals. To stay true to its heritage, and to create the magical, gently complex flavor combination, the rose petals add an essential element. However, we eat a lot of Middle Eastern food and this combination of sweet raisins alongside the garlic and mint will be delicious not only with flatbread, but also alongside many recipes already found on this site, including Falafel with Tahini Sauce, Tabbouleh, Cumin-Scented Carrots, Jerusalem Salad, and Warm Lentil Salad, among others. This is like a new and improved version of one of my standby condiments: tzatziki. The plumped raisins add delightful little bursts of sweetness to the tangy yogurt and fresh cucumber. I do have a few improvements that I’d recommend to anyone making this. First, place the minced cucumber in a colander, liberally salt it, and let it drain for at least an hour. Then, squeeze bunches of cucumber in your hand before adding it to the yogurt. I found that if you don’t do this step, you’ll have a pool of cucumber liquid accumulate on the top of your mast-o-khiar after a few hours in the fridge. Second, I love this with freshly chopped dill in addition to the mint. And that brings me to the third suggestion, which is to use fresh mint. The fresh flavor is so much nicer than the dried in this dish. And finally, please please please use full-fat yogurt—you need to start with something rich before adding the cool cucumber, which lightens the whole thing. One last suggestion: add lots of freshly ground black pepper to finish. The spicy little zing in the background pairs perfectly with the sweet raisins. I couldn’t find any rose petals, so unfortunately I can’t comment on that component. The mast-o-khiar was a delicious sauce or condiment with roasted chicken at dinner. The next day at lunch, the mast-o-khiar dressed a crisp romaine salad made with the remaining cold chicken. The raisins brought a pleasant sweetness. The fresh mint brightened the flavor, with a chiffonade of a few leaves as an attractive garnish in place of rose petals. I allowed for a 30-minute rest before serving, and I believe the flavor was enhanced. Per my preference, there were too many raisins. I think I’d cut the raisin quantity in half the next time. I really like this mast-o-khiar. The flavor is fresh and aromatic and there’s the surprise sweetness from the raisins. I discovered that 10 tablespoons raisins is just about 1 cup, and this recipe makes at least 4 cups of the completed dish. I found this to be easy to prepare and quite flavorful. This is a refreshing dip or spread to have on hand. I pretty much followed the directions as written. I divided the ingredients in two. One half I made as directed and for the other half I removed as much of the water from the cucumbers as possible before making the dip. The one with the undrained cucumbers became watery that same day, while the other didn’t. The next day the drained batch had a little seepage from the cucumbers, but only about a teaspoonsworth. My tasters preferred the drained dip, but agreed that both tasted terrific. The addition of the raisins was different but the occasional slightly sweet bite was nice. I didn’t have rose petals for garnishing. We used it the first day as an appetizer dip with pita bread and cut carrots. The second day we used it with lamb kofta and rice. The third day we used it as a mayonnaise substitute for chicken wraps. My favorite use was in the wraps. Any way you use this, though, it tastes great. When I make it next time, I may save some time and use a box grater to grate the cucumber before draining and perhaps chop the raisins a little, as some of them were rather large. I approached this recipe with a small amount of apprehension as I wasn't sure that I would enjoy raisins in the mix, especially raisins that have been soaked in water and are now soft and squishy. But the final result was very refreshing and enjoyable to eat. The raisins were a lovely complement to the dish. I tried this both as a dip with an artichoke and plain. Last night I tried some that was over 24 hours old and was delighted to find that it hadn't become runny. I also enjoyed the taste of the Mast-o-Khiar with a small drizzle of good olive oil. This recipe was easy to make and the ingredients were readily available. I thought the taste was a little dull, so I added another clove garlic and about a teaspoon kosher salt. After mixing and placing it in the fridge for a couple of hours, the final result was perfect! The raisins add a bit of sweetness, the garlic and salt have some bite, and the mint gives a nice finish. Yogurt and Cucumber Dip Recipe © 2012 James Oseland. 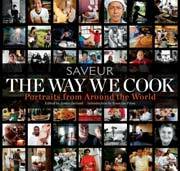 Photo © 2012 Saveur. All rights reserved. All recipes and photos used with permission of the publisher. My family makes mast-o-khiar with just yogurt, cucumbers and mint, plus salt and pepper, but raisens are a nice touch if you like them. We also make mast-o-mouseer, with yogurt and pickled shallots or wild garlic. Oh, that mast-o-mouseer sounds simply fabulous, Lola! I’m curious, do you use approximately the same amount of pickled shallots or wild garlic as you would cucumber? That is, in place of the cucumber? Renee, it’s hard to really pinpoint. Like my mother and grandmother before me, I tend to make Persian foods by eye- that is, no measurements- just using sight to approximate, but I’d say for every pint of yogurt, measure out 1/3 to 1/2 of a cup of dried shallots or wild garlic, reconstitute them in water, and dice finely before adding. Understand completely, Lola. And thank you!